SprintR enables FPS games to work in VR and retain full functionality. We’re working with various development partners to help studios port their existing games to VR, and give players their favorite titles in a new way. Publishers/Studios with FPS, TPS games should consider contacting us for a discussion about porting their products to VR with SprintR as an enabling technology. If you’re interested in becoming a development partner, please contact us here. This section outlines information for developers and publishers who are interested in creating VR games where the player should be free to walk around and explore 3d environments. 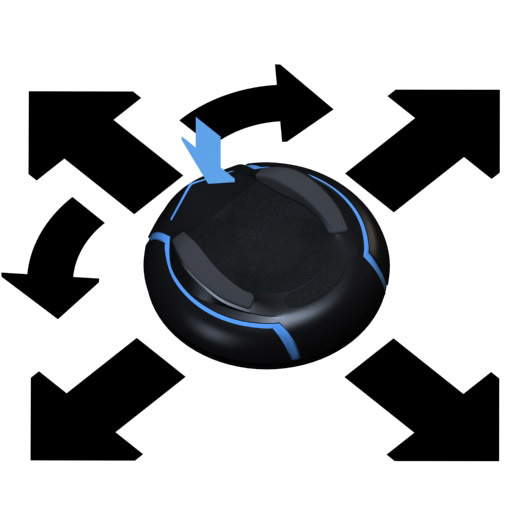 SprintR is a wireless foot-pad that allows players to move around an virtual environment hands free. 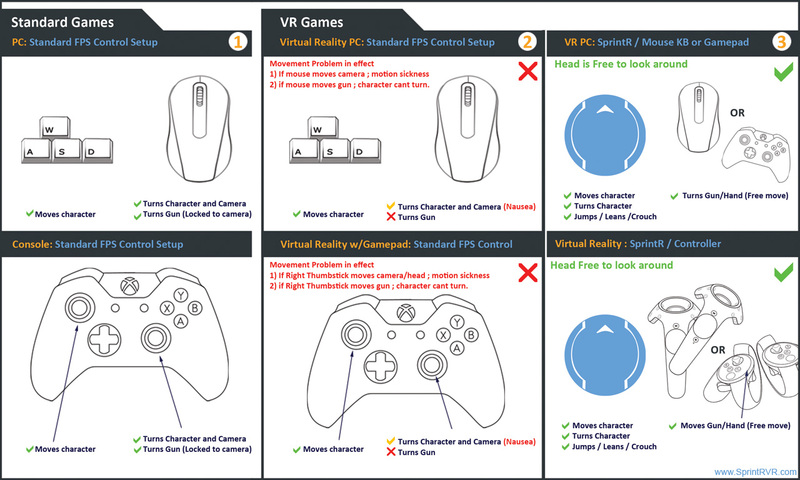 This means that it can work in conjunction with any upcoming hand controllers, VR gloves, and even a mouse or gamepad. This means developers can port exiting games, but also explore a lot of interesting new games where the player is free to explore rich 3d worlds. Read on to understand how SprintR can power your VR worlds.We recommend you sign up for the ‘Developers Newsletter’ at the end of this document for information on dev-kits, pricing, downloads, and release information. Traditional PC FPS and Action games use the WASD keys to change the players position, and the mouse to change the players rotation. If you move the mouse right, the view changes right, the gun moves with the view, and the player is walking in that new direction. 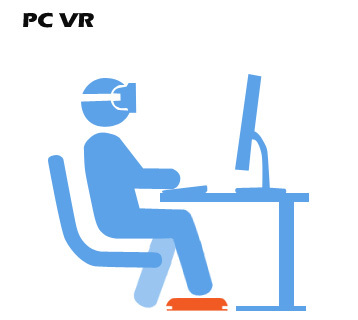 This doesn’t work in VR; you’re basically dragging your player’s head around when they move the mouse, inducing nausea. The same thing applies to gamepad’s and their thumbsticks. basically put, the old controls don’t work for VR. SprintR offloads the movement to one foot. It performs the same actions as WASD + Mouse + Jump. To move forward, you move your foot forward, to move left, you move your foot let. To turn left, you rotate your foot left (the SprintR rotates along with your foot), same thing for turning right. If you take your foot off the SprintR or release pressure, it will center itself and the character will stop moving. To jump you just press down. Now that we have VR movement covered, we can detach the gun from the camera, and have either the mouse, or a VR hand-controller move it around freely. Additionally, we can use the spacebar (the biggest key) to induce a “cursor mode”. This will make the mouse control a 3d cursor, which can interact with UI or scene elements, whatever you like. When the user lets go of the spacebar , the mouse controls the gun/hands again. This allows you to load functions from the keyboard onto the UI, and the player doesn’t have to fumble for keys with their headset on. They just press the spacebar, and quickly select what they want (for example, changing character loadout or weapons). Stay tuned, this section will be constantly updated with useful information for VR games, and how to best convert your projects to VR with SprintR.